Each year, nearly 2,000 triathletes will earn or receive the chance to compete at Ironman's greatest race: the World Championship in Kona Hawaii, in October. About 85% of those triathletes will qualify in one of more than 30 Ironman or Half Ironman events. The exact number fluctuates from year to year; in 2012, it appears that at least 27 Ironman and 8 half ironman races will offer qualifying slots. For example, the intended full Ironman New Zealand was shortened to a half ironman distance due to weather conditions; separately, Ironman 70.3 Japan has been added to provide Asia-Pacific athletes more chances to qualify. The typical half ironman 70.3 event has 28 to 30 qualifying slots, which, when allocated across age groups, means that you'd probably need to win your division. or at least be in the top 3 finishers, to get that Kona Slot. Do you have what it takes to race with the best for your chance to qualify for Kona at a half ironman event? 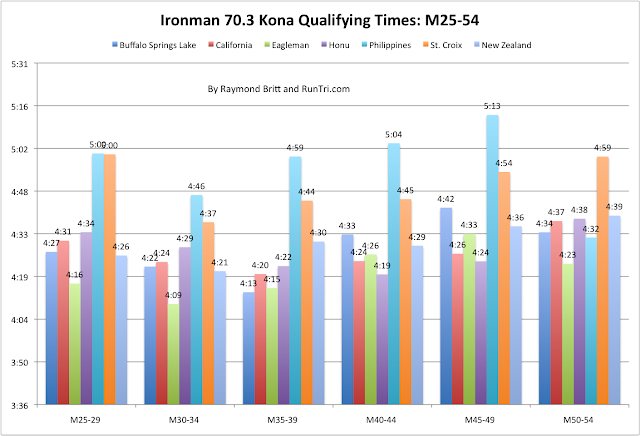 Here's our analysis of the slowest qualifying time by division for six of the top half ironman distance races. 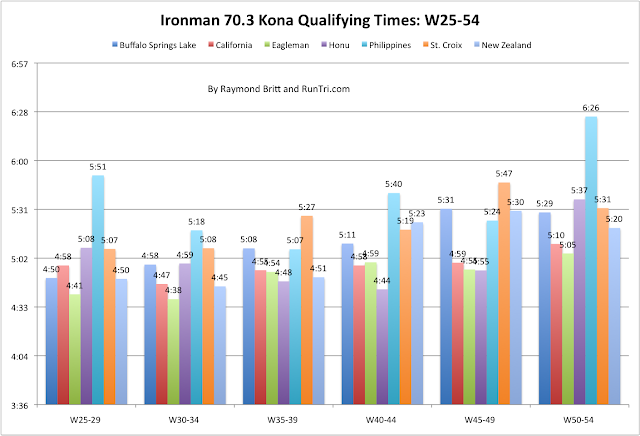 To put these qualifying times in perspective, check our results analysis for each race on our Stats/Analysis page and our Toughest/Easiest half ironman 70.3 race rankings. For everything else, return to www.runtri.com.